Botkins' Parker Geis, bottom, slides into second base as Anna's Kyle Evans tries to make a play during a Shelby County Athletic League game on Monday in Anna. Anna’s Wil Lutheman hits during a Shelby County Athletic League game against Botkins on Monday in Anna. Luthman was 3 for 4 with 4 RBIs. Botkins' Joseph Schipper hits during a Shelby County Athletic League game against Anna on Monday in Anna. Schipper picked up an RBI on a groundout. Anna's Cole Maurer pitches during a Shelby County Athletic League game on Monday in Anna. Maurer picked up the win after allowing one hit in three innings. He had seven strikeouts. 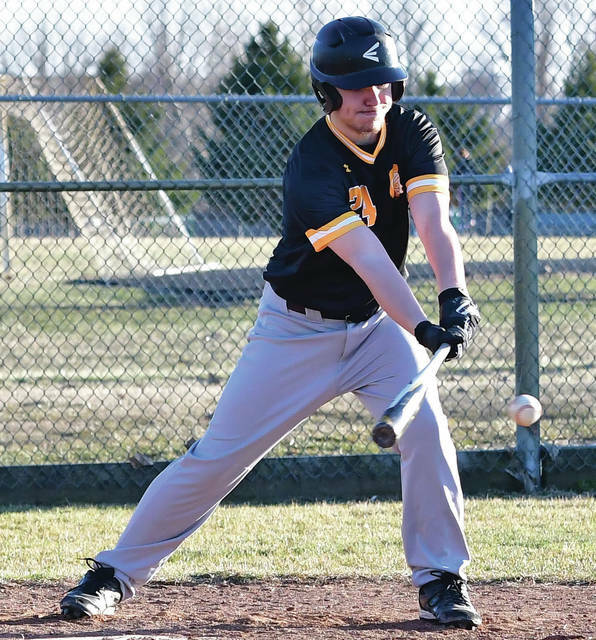 ANNA — Anna jumped out early and cruised to a 17-4 victory in five innings in a Shelby County Athletic League opener against Botkins on Monday. The Trojans scored two runs in the top of the first but Anna scored seven in the bottom half of the inning to set the tone for a big win. The Rockets scored one in the second, five in the third and four in the fourth. Botkins scored two in the fifth but couldn’t add any more to stop a run-rule game. Wil Luthman was 3 for 4 with 4 RBIs for Anna while Kyle Evans was 3 for 3 with 2 RBIs. Jarred Siegle and Carter Elliott each had two hits. Siegle, Luthman and Evans each led the team with three runs and Andrew Scully and Cole Maurer each had 2 RBIs. 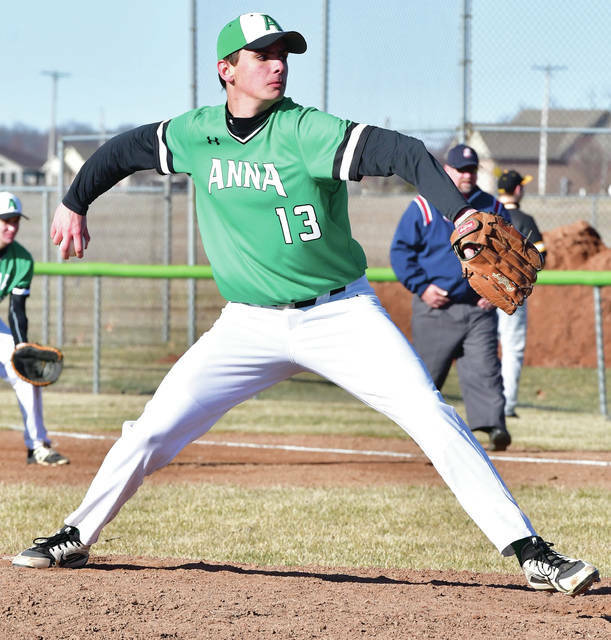 Cole Maurer earns the win for Anna. He allowed one hit in three innings and had seven strikeouts with two walks. Parker Geis was charged with the loss for Botkins. He allowed nine earned runs in two innings on six hits and six walks. Botkins had two hits and four errors while Anna had 13 hits and five errors. The game was scheduled to be played in Botkins but was switched to Anna due to field conditions in Botkins. Several games were postponed or canceled due to wet fields from rain on Sunday and Monday. Other scores: Fort Loramie 24, Fairlawn 0. Postponed: Sidney at Tecumseh, Jackson Center at Russia, Graham at Riverside, Arcanum at Versailles. After an inauspicious start, Fort Loramie ran away to earn a run-rule win at Fairlawn in an SCAL opener on Monday. The Redskins took a 1-0 lead after the first inning but gave up five runs in the top of the second. The Redskins scored four in the bottom half of the inning and added three in the third, then scored four each in the fourth and fifth to end the game. Desiree’ Fogt was 3 for 4 with 3 RBIs while Aleah Frilling was 1 for 3 with 2 RBIs for the Redskins. Six other players had one hit for Fort Loramie. Fogt doubled while Clara Gephart and Ellie Holthaus each had a triple. Frilling picked up the win in the circle. She allowed six earned runs on six hits and five walks in five innings and had 12 strikeouts. Skylar Jones was charged with the loss for the Jets. She allowed eight earned runs on nine hits in 4 2/3 innings and had four strikeouts. Lauren Dudgeon was 2 for 3 for Fairlawn and Renee Gent batted in two runs. Fort Loramie had nine hits and one error and Fairlawn had six hits and five errors. Anna dominated the Trojans on Monday to earn a victory at home in a season and SCAL opener. The Rockets scored five runs in the first inning and then put the game away with seven in the third. They added one each in the second, fourth and fifth. Maggie Stiefel was 2 for 2 for Anna and Taylor Spencer was 2 for 4. Each had two doubles. Olivia Place was 2 for 3 with a triple and Grace Maurer was 2 for 4. Elaina Crosson picked up the win for the Rockets. She had seven strikeouts in four innings. Courtney Sutton was charged the loss for the Trojans. Maggie Buetner was 1 for 2. 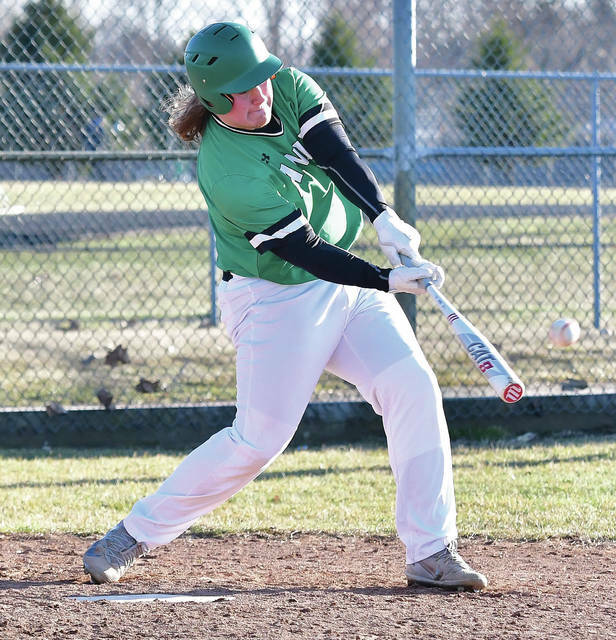 The Railroaders scored five of their eight runs in the last three innings to put away a nonconference win over the Cardinals on Monday in New Bremen. Abbi Thieman was 2 for 4 for New Bremen with 2 RBIs. She doubled and tripled. Molly Smith was charged with the loss. She allowed five earned runs on eight hits in seven innings and had two strikeouts. New Bremen had five hits and three errors while Bradford had eight hits and no errors. Postponed: Jackson Center at Russia, Lehman Catholic at Mississinawa Valley, Riverside at Benjamin Logan, Franklin-Monroe at Versailles. The Yellow Jackets started the season with a dominating win on Monday in Sidney. Prem Dev won 6-0, 6-0 at first singles, Grant Hoying won 6-1, 6-1 at second singles and TJ Leonard won 6-0, 6-1 at third singles. Jersain Brux and Broc Bey won 6-0, 6-1 at first doubles and Kazuma Okada and Tyler Overholser won 6-0, 6-1 at second doubles. Lehman Catholic opened the season with a victory on Monday in Springfield. In singles, Danny Lins lost to Kellen Kronour 6-1, 6-3; Sam Gilardi defeated Kolton Tyson 1-6, 6-4, 7-5 and Max Schmiesing lost to Zach Thompson 6-0, 7-6 (7-5). “Sam (Gilardi) kept his focus and grinded out a tough win after losing the first set quick to clinch the team win for us,” Ungericht said. Lehman swept the doubles matches. Elias Bezy and Elijah Jock defeated Keaton Campbell and Brenden Leffel 3-6, 6-4, 6-1 and Sean Toner and Cole Kramer defeated Reese Calicoat and Arnie Scarberry 4-6, 6-3, 6-3. Botkins’ Parker Geis, bottom, slides into second base as Anna’s Kyle Evans tries to make a play during a Shelby County Athletic League game on Monday in Anna. 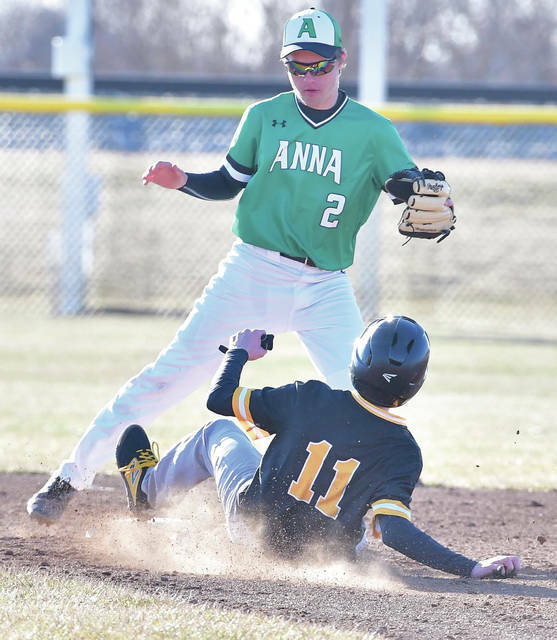 https://www.sidneydailynews.com/wp-content/uploads/sites/47/2019/03/web1_DSC_0327-2.jpgBotkins’ Parker Geis, bottom, slides into second base as Anna’s Kyle Evans tries to make a play during a Shelby County Athletic League game on Monday in Anna. Botkins’ Joseph Schipper hits during a Shelby County Athletic League game against Anna on Monday in Anna. Schipper picked up an RBI on a groundout. Anna’s Cole Maurer pitches during a Shelby County Athletic League game on Monday in Anna. Maurer picked up the win after allowing one hit in three innings. He had seven strikeouts.